Buses have been around for longer than most people think. The very first bus service appears to have started in Paris and was launched in 1662. Designing it was one of the final tasks of that great French mathematician Blaise Pascal who designed a bus network consisting of a number of horse drawn public buses and where the bus fares were related to the distance travelled; then a novel concept. The buses were called “carrosses” and each one carried eight passengers. Unfortunately the system proved to be unsustainable. Originally designed as a service for everybody, slowly the fares crept upwards until eventually it was only the rich who could afford them. Unable to attract sufficient passengers, the service closed just fifteen years after it had been created. Many years after, a new bus service was launched. Again this was in France but this time in Bordeaux in 1812 where another horse drawn bus service was developed. This proved to be popular and similar services were soon adopted in Paris and a little later in London and New York. Essentially the buses were long “stretched” stagecoaches where passengers rode inside and on the roof. They were called “omnibuses” which means “buses for everybody” or the people’s bus. They proved to be very popular and horse drawn buses continued to operate until 1914. In the 1830’s, horse drawn buses began to be replaced by steam driven ones. With the invention of electric power, electric trolley buses were developed which took their electric power from overhead electric cables though it was not until 1895 that the first bus service that used buses powered by internal combustion engines was launched. The London General Omnibus Company (or LGOC) was founded in 1855 by amalgamating some of the smaller bus companies. The company started using internal combustion powered buses in 1902 though they were in competition with the National Steam Car Company which ran a fleet of steam powered buses, though steam buses stopped operating in 1919. In 1933 LGOC and the Underground Group which ran London Underground combined to form the London Passenger Transport Board, later to become London Transport which is strongly associated with the red London bus. A big change came about in the 1980s when bus services were privatised, though what happened in London was different from the rest of the country. 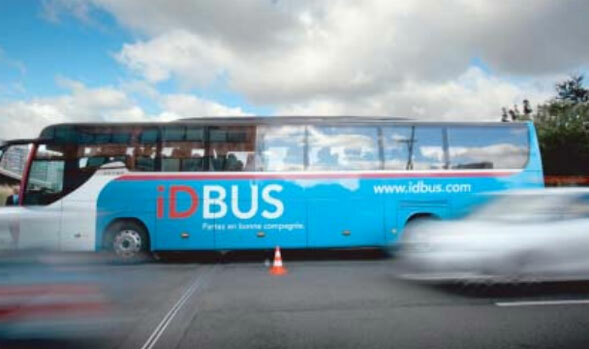 One of the latest important events in the history of buses is the recent launch of the direct iDBUS coach routes from London to Paris and Lille. This is a fleet of coaches that offer the latest in modern bus technology with individual air conditioning for passengers and incorporate all of the recent developments in passenger safety. We have come a long way in terms of bus transport since the briefly fulfilled dreams of Blaise Pascal.